Email me if you're interested in this painting. Here's a larger painting, done a few years ago. My son Jared and I were making the rounds of galleries in Santa Monica one day, and walked into a show of minimalist paintings. As Jared came through the door, I noticed his shadow cast on the sunlit wall. 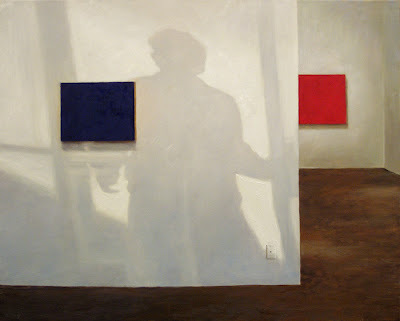 I immediately thought it would make a great subject for a painting--the realistic shadow contrasted with the literal abstraction of the blue and red artworks and stark white walls. It was as if someone were throwing a shadow across a Mondrian painting. I made Jared walk in and out the door several times while I snapped photos. The gallery owners must have thought we were nuts. On the other hand...they're probably pretty used to artists. LOVE IT!!!! minimilist and abstract shadows....a perfect marriage. The white background make it more stunning with the contrasting blocks of colors. Tomorrow I am going to check out your mural in Sussex! Hi Alvin--good to hear from you. Thanks for the great comments! You're going to see the mural, eh? That's nice of you to do. It's kind of easy to miss, because it is in an alleyway downtown on the main street, on the side of a video store. It's an autumn landscape with a pioneer family in the center. I think they have a lot of murals in Sussex now. Wish I could join you for the trip. Empty rooms and light falling on a wall - irresistible. I think this is what most of us continue to look for, the Hopper inside! I think you're right, Sheila. Glad you're back. Fantastic!!! Love the play of light and shadow. That is really cool Don, smokin'...I did something similar a few yrs back, but it's not near as good as this. As a matter of fact, I think I'll trash it now! Hi Nick, thanks for the encouraging words--means a great deal coming from such a fine painter as yourself. Don't trash that painting though!